This article was originally a paper presented at Queens University Belfast at the first Folk Horror Conference on Friday the 19th of September 2014. Folk horror is a strange form of media. It has a craving for the need to be defined and canonised whilst also being a sub-genre which seems inherently intuitive, especially when becoming aware of its common likenesses in films, television, books, and other media. This strange combination of obviously shared thematic and aesthetic traits and a subjective, almost race-memory recollection in its reception perhaps explains why it has taken so long to define what it is that makes a folk horror. In this article, I aim to put forward a thematic litmus test of ideas, built in order to help define what exactly the sub-genre of folk horror is and how we can apply that to its appearances in cinema with the intention of eventually building a canon of work. What exactly is a folk horror film? Several ideas often come to mind. 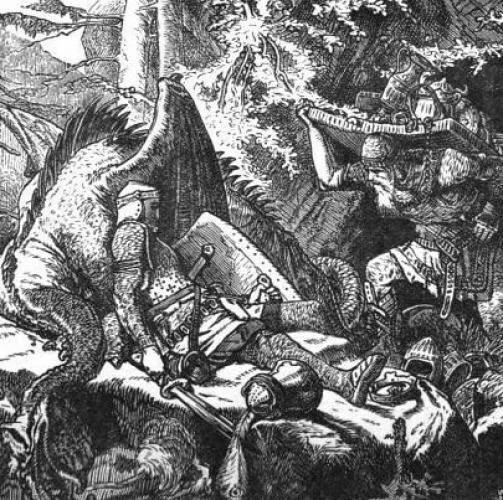 The first is a narrative link with a folk tale, a folkloric idea, or even a fake creation of something aesthetically folkloric (a common practice since the birth of interest in folklore studies, namely in books such as Sir James Frazer’s The Golden Bough). It’s a logical idea that justifies some of folk horror’s most obvious examples but not all encompassing enough to include all of its themes and ideas. Another idea was one presented when initially looking at the genre from a musical angle; that the films in question have aesthetic links to uses of folk music. The idea seems more of a fugue on the sub-genre’s links with folklore and covers even less potential films. “Grendel was the name of this grim demon, haunting the marches, marauding round the heath and the desolate fens; he had dwelt for a time in misery among the banished monsters, Cain’s clan, whom the creator had outlawed and condemned as outcasts.” (Heaney, p.6, 1999). For me, this sums up the Folk Horror Chain and all of its separate strands; strands that are eventually traceable in the medium of film many years later. The first link in this chain is the use of the landscape and the environment. In this quote, the landscape is used as the hunting ground for Grendel and in folk horror is used for a number of narrative and aesthetic reasons. Apart from setting a strong aesthetic theme for the films, often moving out of studios and using the visuals of the natural and the rural, the landscape explicitly isolates the characters and communities within them. This isolation forms the next part of the chain and leads to communities that develop skewed morality and belief systems of practice. This can form into a variety of different outlets but often manifests in versions of paganism, occultism, or even the simple abuse of Christianity. There’s little doubt that folk horror and its happenings rely on events being located outside of general society in both a physical and in a sociological way. These belief systems eventually lead to the final link in the chain; the manifestation due to these belief systems. This can range from summoning up something that is genuinely supernatural such as a demon or a ghost, or lead to some form of violent act such as possession, sacrifice or something else that leads to violence and eventually death. For so long the images of three films, all British and from the same period, have dominated the description of folk horror. My own first experience of the term came from the back of one of their VHS covers and has only in recent years actually come to the attention of cineastes as a genuine descriptor of genre and of film. Suffice to say, all three explicitly follow the narrative route of the Folk Horror Chain. These three films are Robin Hardy’s The Wicker Man (1973), Piers Haggard’s Blood On Satan’s Claw (1971), and Michael Reeves’ Witchfinder General (1968). With the ideas of a thematic chain linking all the traits associated with the sub-genre, I would like to expand upon this trilogy of films and get away from an increasingly prevalent method of thinking in folk horror, where everything else is overshadowed by these brilliant films. With the use of this chain, folk horror can become a far broader cinematic topic, ranging from films of many different eras and countries. By applying and searching out these traits, the canon of folk horror can evolve into something that is more flexible and encompassing rather than reactionary and generic. To begin the use of this chain, the application and proof of it in the main three folk horror films can act as a spring board to expanding the sub-genre. Whilst I wish to move away from these films in one sense, using them to help define and solidify the effectiveness of the Folk Horror Chain is essential. All three films begin in the landscape. 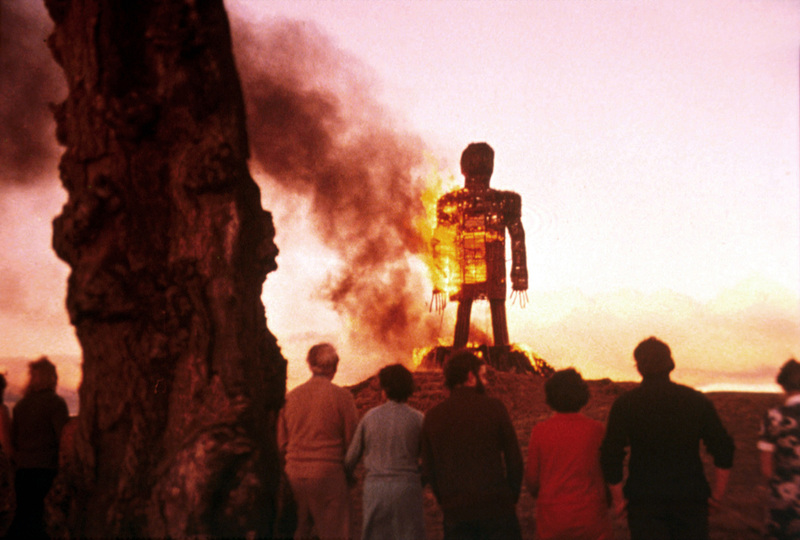 The Wicker Man‘s opening (at least in the cut before the recent re-emergence of previously lost material) begins in Sgt. 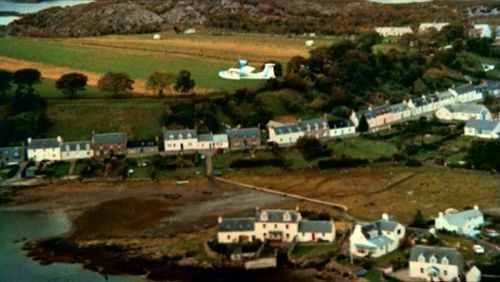 Howie’s plane flight over the rural isles of Scotland and eventually over the landscape of Summerisle. The fact that Summerisle is an island greatly enhances its sense of isolation, perhaps explaining why it is such an effective and probably the most famous of folk horror films. Blood on Satan’s Claw also explicitly begins in the landscape, putting emphasis on its emptiness and on the ground, as it is the unearthing of a Jamesian Inorganic Demon from the soil that begins its horror. 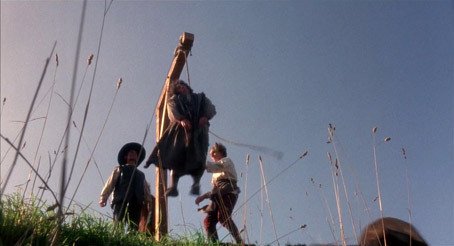 Witchfinder General begins in the isolated Norfolk landscape, with Matthew Hopkins’ vile actions only really being possible in small communities isolated by the vast East Anglian broads. The three films also offer up a variety of potentials in terms the moral structures that this isolation creates and the eventual summoning that this can bring. 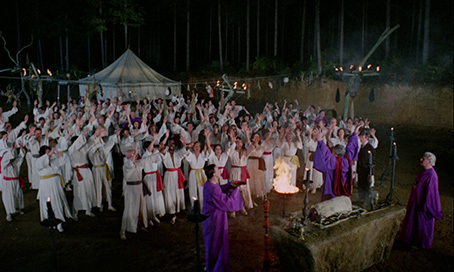 The Wicker Man eventually leads to a pagan sacrifice, Blood eventually leads to the manifestation of a demonic creature (supposedly the devil), and Witchfinder leads to series of violent tortures and murder in the name of Christianity. With the chain having a clear presence in all three films, it is easy to argue that it can at least be applied to the most obvious and most discussed examples of the sub-genre. But what of the lesser spoken about examples and even films that are perhaps not even discussed within the sub-genre at all? Let’s begin with some applying the Folk Horror Chain to lesser spoken about British examples. Gordon Hessler’s Cry of the Banshee (1970) is a surprisingly unspoken example of British folk horror. Surprising chiefly because it exhibits almost all of the traits of the more famous folk horror trilogy. It stars Vincent Price as a Lord who kills a local coven of witches. 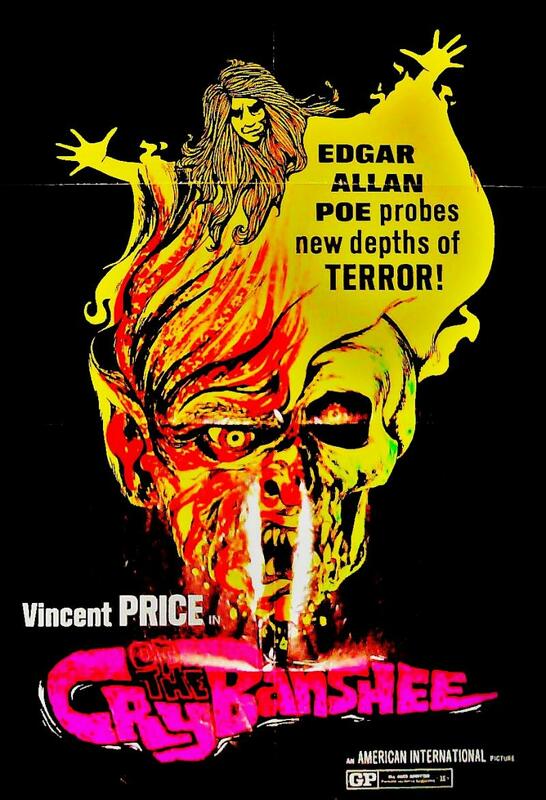 It blends the stark realism of Witchfinder General with Blood on Satan’s Claw’s supernatural elements and again stems from a rural isolation creating a skewed belief system with the only difference being that the final summoning is a mixture of both the supernatural and humanity’s evil (i.e. torture and murder). David Gladwell’s Requiem for a Village (1975) is an entirely different folk horror proposition. Its narrative is loose and therefore doesn’t follow the Folk Horror Chain in a strict cause-to-effect scenario. It does however show an isolated rural community whose way of life is under attack from the modern industrialisation of the mid seventies. Its clash between the archaic and the modern leads to people walking out of their graves and culminates with a sexual assault at the hands of a motorbike gang, again a mixture of supernatural and the natural evil of man all in a still-isolated rural vista. 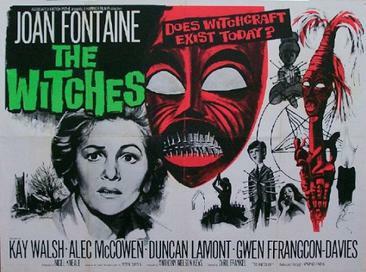 Cyril Frankel’s The Witches is one of a number of Hammer’s films that has elements of folk horror. It is again set in a modern rural village and follows a teacher (Joan Fontaine) who uncovers a coven of Black Magic, building up to an attempted sacrifice. It makes use of the picture-postcard English rural village and its aesthetics are used in the film and by the characters to hide their esoteric beliefs. For folk horror the common “wall of silence” is often a tool used against the outsider though instead of it hiding a group of murderers a la Murder On The Orient Express, it hides a group of skewed belief practices. The idea of the Folk Horror Chain opens up the sub-genre to more than just British films of the era of the counter-culture. It can enhance the understanding of previously ignored films as well as recontextualise more well-known examples as well. Night of the Hunter. The Texas Chainsaw Massacre. The Blair Witch Project. Some of these choices may at first seem controversial, specifically because of their presence in other sub-genres (film noir, slasher, found footage) but applying the Folk Horror Chain allows their thematic content to be very much in line with the more traditional folk horror films. Night of the Hunter (1955) is a film about a religious convict chasing two children for money that their father stole, and is very much in the folk horror tradition in spite of often being labelled as southern gothic and film noir. The rural location, the fairy-tale aesthetics and nightmares, and the beliefs of the community blinding them to Harry Powell’s true nature all builds to make up a thematic folk horror. The Texas Chainsaw Massacre (1974) is equally as isolated by its rural location, only instead the community living in it have taken to cannibalism rather than paganism. Tobe Hooper makes just as much use of the rural landscape of Texas as Hardy does of Summerisle and the main antagonist, Leatherface, has something supernatural and demonic about his nature. The final shot in particular seems highly ritualistic, almost invoking some summer solstice type release as he swings his chainsaw with the sun rising behind him. Of all of the films that come under the banner of “pre-slasher”, this is just one of a number that also exhibit elements of folk horror. Edurado Sanchez and Daniel Myrick’s The Blair Witch Project (1999) plays on the idea of getting lost in the woods; a very typical folk horror trope. The supposed antagonists are witches, it is entirely set in the shadow of a local folkloric legend of the Maryland Blair Witch and is filmed predominantly in a rural forest location (which explicitly and knowingly cuts off its characters from the main town). All of these traits link back to the Folk Horror Chain. Hour of the Wolf. Haxan: Witchcraft Through The Ages. Kuroneko. Kwaidan. Trying to cover the folk horror practices of the rest of the world is a huge task and one that would require far more time than allotted. However, there is time to show the Folk Horror Chain at work in several other cinematic cultures from Europe and Asia. It could be argued that Benjamin Christensen’s Haxan (1922), is the first true folk horror film (though not the first fantasy film to be based on folklore – Paul Wegener’s Der Golem (1920).). Though it masquerades as a documentary, the imagery and narratives it suggests are a perfect embodiment of the Folk Horror Chain. It presents witches in rural locations summoning up demons and devils, though ultimately suggests more psychological conclusions. 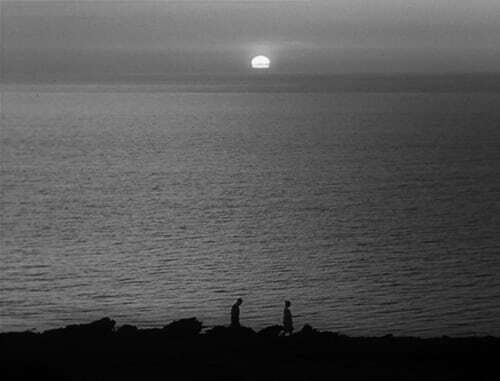 Ingmar Bergman’s Hour of the Wolf (1968) is one of a number of his films littered with elements of folk horror (the other two obvious examples being The Seventh Seal (1957) and The Virgin Spring (1960)). It follows an artist living on an isolated island who is plagued and haunted by visions and characters who are supposedly spirits. This is our first example that doesn’t use all of the elements of the Folk Horror Chain; a type of film that is perhaps more subjectively folk horror-esque than quintessentially part of the genre (a problem plaguing the canonisation of any sub-genre). Japan also has a strong tradition of folk horror though the aesthetics of its folklore perhaps make its films strange visual bed-fellows of the British folk horror tradition. Films by Kaneto Shindo such as Onibaba (1964) and Kuroneko (1968) are strong examples of the Folk Horror Chain with groups of people isolated in landscapes summoning or even becoming something demonic. The former shows two women who live in a swamp who kill wandering samurai, the latter follows two women who become reincarnated as cat demons who haunt a local forest after being killed by local warriors. 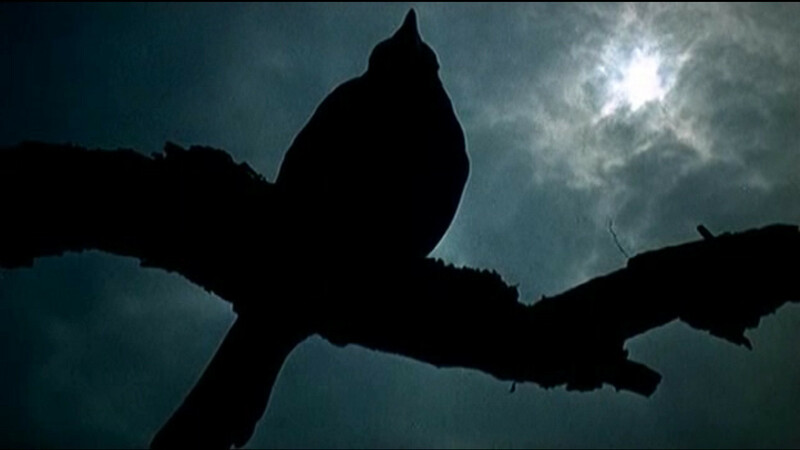 Even films such as Masaki Kobayashi’s Kwaidan (1964) present the Folk Horror Chain in various forms. Based on Japan’s answer to M.R. James, Lafcadio Hearn, it shows four different stories all surrounding isolated rural communities with supernatural beings and isolated moral belief systems being at their core. With the idea of the Folk Horror Chain, I want the emerging of the sub-genre to be easily defined but also layered and not too rigid as to discount films based on when and where they are made. To recap and conclude, the ideas of the Folk Horror Chain can also be shown to explain associations with other cinematic trends outside of the horror genre entirely. Rural Location – Isolated Groups – Skewed Moral and Belief Systems – Supernatural or Violent Happenings. If a film were to take just one or two of these aspects rather than all of them, as the best and most obvious examples do, it could perhaps explain why certain films are present in the discussions of folk horror in spite of not being from the horror genre. Films such as Kevin Brownlow’s Winstanley (1976), Ken Hughes’ Cromwell (1970) and John Gilling’s The Crimson Blade (1963), all tend to pop up in discussions of folk horror in its various guises. All of the films deal with aspects of the Folk Horror Chain and shows a polar in the third part of the chain; the supposed belief systems that are skewed are in fact morally superior to the current status quo and the fight for their recognition replaces the more commonly esoteric belief systems of the typical folk horror. It is more than simply their historical window dressings that link these films with the sub-genre. Other films such as Roman Polanski’s Cul-De-Sac (1966), Sidney Hayes’ Night of the Eagle (1962), John Llewellyn Moxey’s The City of the Dead (1960), Terence Fisher’s The Devil Rides Out (1968), and countless numbers of others from a variety of different eras and countries, all have ties to the Folk Horror Chain, whether it only uses one or two aspects of it or uses the entire domino effect of the chain build its thematic narrative. Though initially intuitive as a response of awareness, the folk horror film has been formed as a sub-genre because of a group of shared thematic and aesthetic traits. These traits can be formed into the theory of the Folk Horror Chain: Landscape – Isolation – Skewed Moral Beliefs – Happening/Summoning. That through relating a film and its narrative arc to the structure of this chain, we may define a film as folk horror and also gauge just how much of a folk horror film it really is. And that by doing this, a canon of cinema can be built that is both easily defined and recognisable but also not limited to one particular country or era of cinema. Pingback: Sour Ground: Folk Horror in the United States, 1967-2017 – What is an Interdisciplinary Methodology? Although it’s a novel and tv miniseries, Harvest Home / Dark Secret of Harvest Home is a good example of folk horror. Blanche (1971) – Walerian Borowczyk (Arrow Video).